The "Price My Game" search feature on VideoGamePriceCharts.com is a great way to find the price for any video game I want. But It's kind of a pain going to the home page, then clicking the search box, and finally entering the game I want to look up (I know its not that many steps but when you do 8-9 searches per day, it gets to be annoying). I have a little hack for all our Firefox users to do these searches in one step (directions for doing the same thing in Opera and in Internet Explorer). 1. Right Click on the "Price My Game" search box. It's in the upper left corner of every page and looks like this. 2. A prompt will come up. 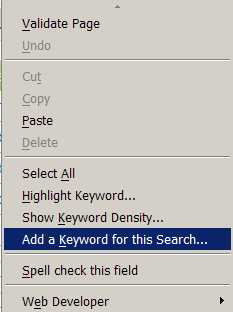 Choose the "Add a keyword for this Search" option. 3. Name the bookmark and keyword. I used Name = "VideoGamePriceCharts.com Search" and Keyword = "vgpc". Do whatever will help you remember this, but keep the keyword short. You will be typing that a lot. 4. You have officially created your own custom search. Congratulations! To use it, hit "Ctrl-L" or just click on the address bar at the top of Firefox. Now type "vgpc" followed by a space and what you want to search for. I did "vgpc final fantasy" which brings up every final fantasy game in our pricing database. Now you can search for any video game prices you want with one simple step. Thanks to our great programming/technical staff for the heads up on this ability in FireFox. I'm not sure if you're aware but this is also possible for anyone still using IE7 but it requires the Developer Tool add-on. I prefer FireFox myself but we are required to use IE because that's what they all use at work. you can set up a search w/ opera in pretty much exactly the same way. sweet. Thanks Tanooki and Anonymous for letting us know that Opera and IE have features that can do the same thing. I've updated the article with links to Opera and IE guides to setup this search.